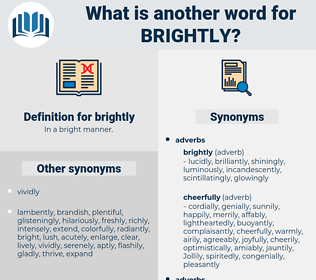 What is another word for brightly? inconspicuously, dourly, modestly, gloomily, Duskily, sorrowfully, severely, unhappily, wretchedly, morosely, dolefully, demurely, plaintively, disconsolately, dimly, boringly, dejectedly, pessimistically, sourly, sternly, mournfully, simply, despondently, somberly, dismally, dispiritedly, glumly, drearily, drably, unobtrusively, forlornly, obscurely, unpretentiously, sullenly, Shadily, cheerlessly, colorlessly, quietly, murkily, abjectly, plainly, sulkily, heavily, dolorously, bleakly, chastely, conservatively. He stepped so softly that no one could have heard him, but he shone so brightly that he made the whole house light. His eyes were shining brightly.